Classic Film and TV Café: Blacula Is "One Strange Dude"
Based on Count Dracula's reputation alone, I question the rationale in seeking his support to abolish slavery. 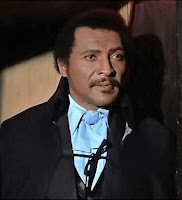 But that's what Prince Mamuwadle and his wife Luva attempt in the prologue of 1972's Blacula. Not surprisingly, the Count comments that "slavery has merit" and offers to buy Luva. Mamuwadle becomes incensed and, following a scuffle with Dracula's henchman, he becomes the famous vampire's latest victim. Dracula locks Mamuwalde in a coffin, curses him to thirst for blood forever, and dubs him the Black Dracula--or Blacula. He then seals the room with the coffin, forcing Luva to watch over her husband until the "flesh rots off her bones." More than a century later, a couple of antique buyers purchase all the furniture in Castle Dracula and ship it to California. Once there, one of them unlocks Blacula's casket, unleashing the vampire on contemporary Los Angeles. 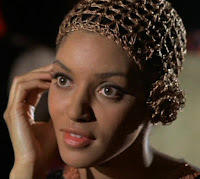 Blacula barely has to time to claim his first two victims before he spots Tina, who--as you have guessed--appears to be the reincarnation of Luva. Blacula was one of several contemporary-set vampire films produced following the surprise success of Count Yorga, Vampire (1970). Even Hammer Films abandoned its Gothic chic to make Dracula A.D. 1972. Yet, Blacula stands out among these modern vampire tales because it was the first notable blaxploitation horror movie. Its detractors claim that Blacula offered nothing new other than trying to appeal to an African American audience (more on that later). 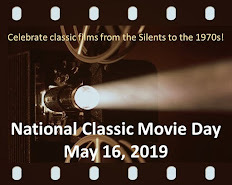 But even if that were true, one cannot ignore its historical significance in inspiring other 1970s blackploitation fright films such as Abby, Blackenstein, Ruby, and Dr. Black, Mr. Hyde. 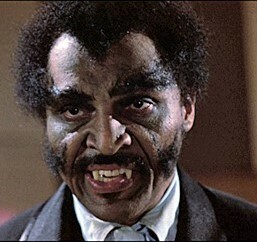 Although most of Blacula is pretty predictable, it takes a different approach with its protagonist. Blacula is an intelligent gentleman, who has enough style to pull off wearing a cape in the early 1970s (though no one comments that his clothes could use a cleaning). It helps that the vampire is portrayed by 6' 4" William Marshall, who earned great acclaim for his stage portrayal of Othello in the early 1960s. With his deep voice and air of sophistication, it's no wonder that Tina (Vonetta McGee) becomes attracted to the handsome vampire...even as a friend notes Blacula is "one strange dude." The films' sucess spawned a hastily-made sequel Scream Blacula Scream starring Marshall and Pam Grier. When my sister and I went to see it at the theater, we were asked to leave after one of the projectors broke. We didn't have to worry about a refund because my sister was an employee of the theater chain. Still, I've never seen this sequel--which I will rectify this month. Starz has both Blacula films available on demand. I shared Blacula with my daughter last year. I told her it was "fun", "William Marshall's voice! 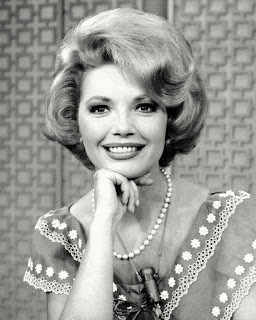 ", "1970s fashions" and "Liz McIntyre". We had red wine with our popcorn and enjoyed the aforementioned "fun", especially the doomed decorators. The next time you're having a movie night with popcorn, red wine and 1970s fashions, I'm crashing your party. This sounds like a fun evening! 'Not surprisingly, the Count comments that "slavery has merit"'.....I'm sure he would! Especially if they donate blood. Vonetta McGee is gorgeous in that photo but I'd be watching it for Marshall, a favorite from Pee-Wee's Playhouse. Did you know he was also an opera singer?